Video: If you're interested in a stallion, it's only natural that you'll want to see his top performers. The Stallion Register Online (SRO) now links to free video replays of recent winners and stakes-placed runners for all featured stallions. More video: For younger stallions, you'll also find videos of their best wins. We currently link to races from 2007 and later -- and we'll add older races soon. Inbreeding notation: Throughout the SRO and other products from The Blood-Horse, you'll notice that we've standardized our inbreeding style to include "S" (sire) and "D" (dam) notations. Race purses: You asked for information on purses -- they're often an indicator of race quality -- and we delivered. Race distances: This is another reader request. We've now standardized our format for displaying race distances. No more "1 1/2 miles" for the Belmont Stakes (gr. I), for example -- it's now "12 furlongs." Bluebloods partnership: The Blood-Horse is proud to partner with the Australian Thoroughbred stallion directory Bluebloods (stallions.com.au). 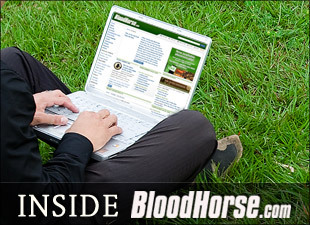 You'll find a Bluebloods roster on our home page and our search results now include stallions in Australia and New Zealand. Combined with our similar partnership with Europe's Weatherbys Stallion Book, The Stallion Register Online is the best international Thoroughbred stallion reference. Head over to The Five-Cross Files for more detailed information, or find your favorite Thoroughbred sires at Stallion Register Online.